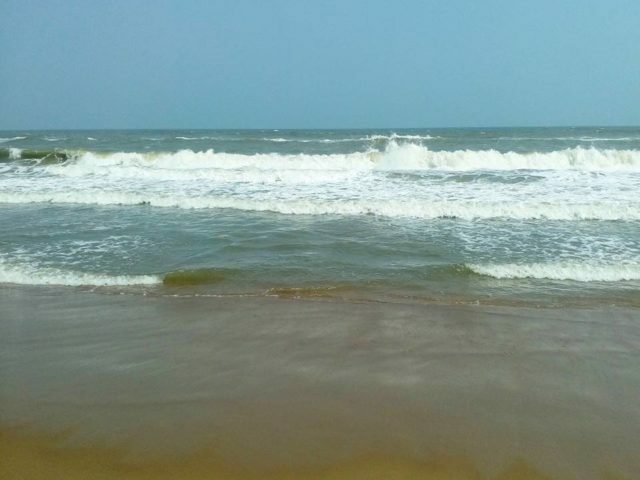 The magic of Puri, Odisha - Ghumakkar - Inspiring travel experiences. Let me begin this travelogue with a place of interest where every entity speaks of the Lord. From the temple tops to mudflaps of vehicles, from stalls to stationeries, you can find His images, designs and paintings in every nook and corner. Lord Shree Jagannathis not just confined to Puri. He is considered as Master of the Universe by the devotees who assemble each day in a throng just to get a glimpse of Him. Out of the four major pligrimages in India, Puri represents the east. Other three being Badrinath in the North, Dwarika in the West and Rameshwaram in the South. 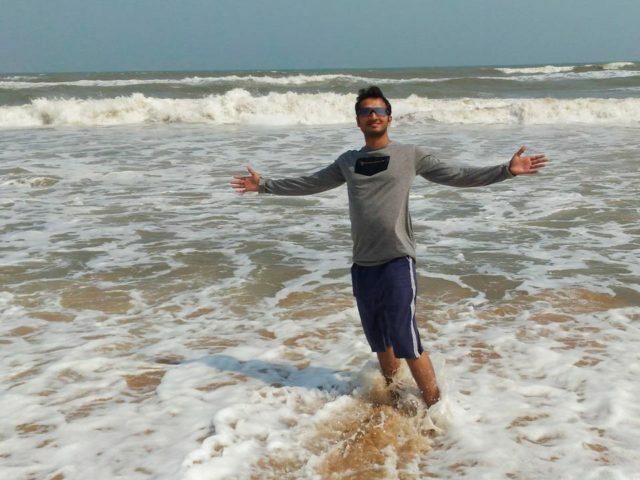 This is your backpaker friend Sudip taking you on a weekend trip to Puri. Our journey starts from Rourkela, the steel city (the city I am currently living in). Direct AC buses for Puri are avaiable here at a cost of 450 INR (cheaper if you go for the non AC ones). So my bus started at 9.30 pm and my eyes closed while listening to the phone’s playlist. The rising Sun was the first one to greet me when I opened my eyes in the morning. Our bus had crossed Cuttack and was passing through Bhubaneswar – the capital city of Odisha. It was already 6 am but I was still heavy-eyed, like cmon there’s more than an hour till we reach. On the way theres a place called Sakhigopal. 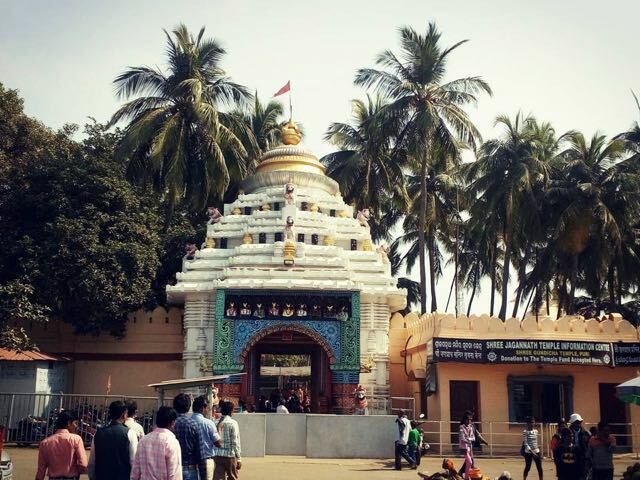 Around 19 kms prior to reach Puri, this place is famous for Sakhigopal temple, banana and coconut trees. One can see long standing thicket of coconut trees surrounding the houses and paths in that area. It was almost 8 when the bus slows down near the gate of Goddess Bata Mangala, which means we are about to enter Puri. In Odia language, ‘bata’ means ‘way’. Since She is enshrined on the way to Shree Jagannath Temple, Goddess Mangala here is referred to with that name. Tourists and pilgrim offer puja/worship here for their safe journey ahead. At around 8.15 am, bus dropped us at the stand near Gundicha Temple. From there one can take autorickshaws, tricyles, e-rickshaws and roam around any part of the city. I decided to check into my prebooked hotel near Model beach. Took an autorickshaw and reached hotel Park Lagoon which is nearby Mayfair Hotel. Lip smacking breakfast was served on arrival. 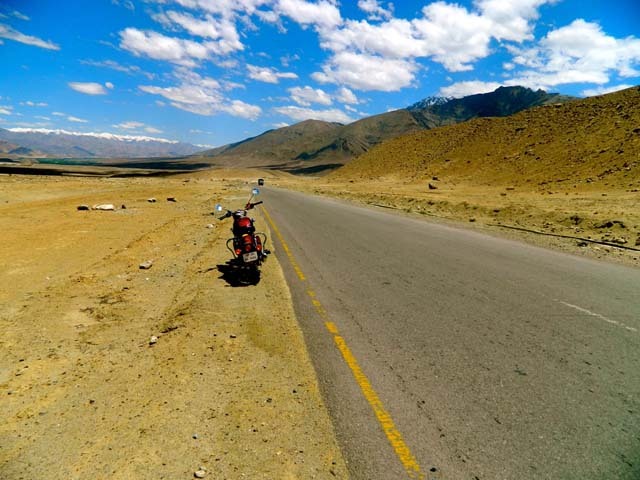 Hotels around this area (Chakra Tirtha Road) are well maintained and have amiable staffs. Beach is maintained by the Mayfair administration so it is clean and less crowded. After freshening up I geared up to explore the temple and places around. 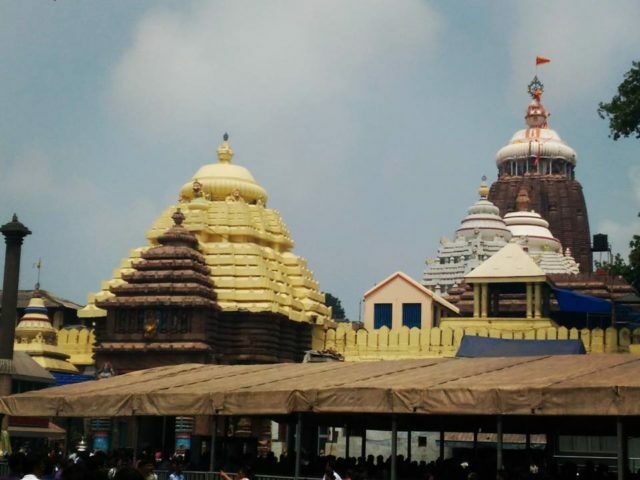 At first I went to Shree Gundicha temple which is about 3 kms from the main Jagannath Temple. The place is popular being the destination for the world famous Chariot festival – The Ratha Yatra. Lord Jagannath along with His siblings Balabhadra and Devi Subhadra stays here for 7 days before returning back to the main temple. Except for those days, very less people are seen here for the rest of the year. With a beautiful garden inside, this temple complex houses several deities. Strolling took 20 minutes since there are barricades arranged in such way that you cannot escape once you decide to enter. I finished the level finally and came out. 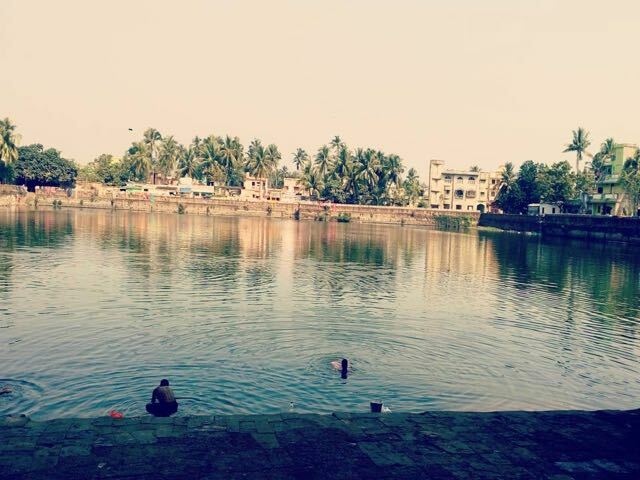 About 10 mins walk from the temple there is a pond called Indradyumna Sarovar. Tales are heard that ancient king Indradyumna was performing Ashwamedha Yajna (horse sacrifice) and to honour the assembled brahmins, donation of 1000 cows was made. The hooves of those heavy cows created a deep depression on earth thus creating a lake. Their urine filled up the lake. Since then this place is considered a holy one. There are three temples nearby: King Indradyumna’s temple on the left side, Sakhi Gopal temple to the right and Nilakantesvara Shiv temple midway down the stairs that leads to the water tank. While coming back I hired a rickshaw to go to Narendra Pokri/ Sarovar. 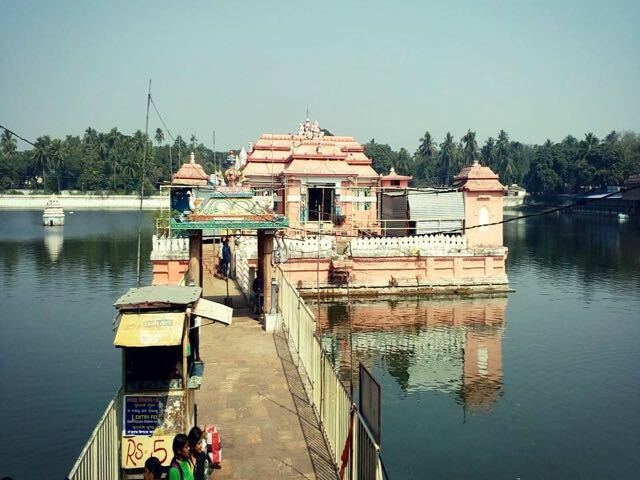 Designed as a temple island, this place is famous for Chandan yatra, when Lord Jagannath rides a boat along with Lord Balabhadra and Goddess Subhadra. Narendra Sarovar is about 2 km from the main Jagannath temple. I have one more temple to cover which is Shree Loknath temple dedicated to Lord Shiva. It was 11.45 am and sweltering as I proceeded for my next halt. Fifteen minutes of walk from the Jagannath temple and I reach another shrine called Shree Loknath temple dedicated to Lord Shiva. The Shiva Linga remains mostly submerged in water as devotee consider it to be River Ganga flowing atop it. 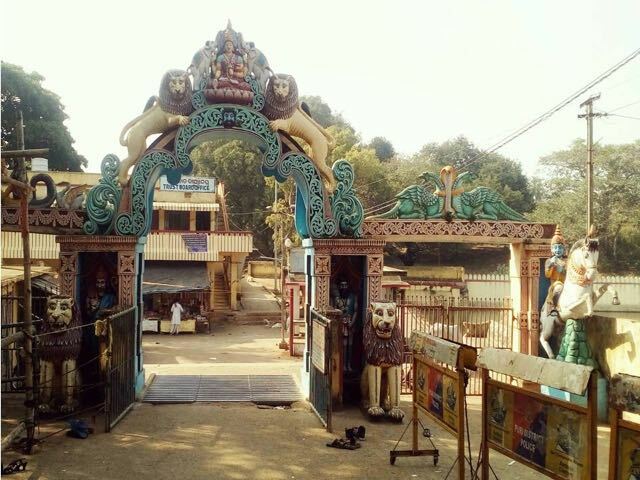 Lord Rama is said to have established this temple. The mid day ritual was just over and it opened for the devotees, so luckily I could get to see the linga covered in flowers and wood apple leaves. There is a small pond in the temple complex which had numerous fishes earlier ( I saw them during my visit when I was a kid). Now it was getting late and visit to Shree Mandir would be the climax for the day. So I am back to the Jagannath Temple road. Before proceeding to the entrance, mobile phones, leather belts, shoes/ sandals/ slippers, etc everything needs to be deposited on the stands installed near the temple. Well I managed to clear those formalities in one of the stand. Queuing through a serpentined series of barricades, I was finally standing infront of the main entrance known as Singha Dwar (Lion’s Gate). This is the eastern gate. There are four entrances/ exit gates in four directions. There is a rock pillar known as Aruna Stambha or Garud Stambha, on the top of which Garud (large eagle like bird) is seated with folded hands, which is considered as carrier of Narayana. This whole pillar structure is carved from a single rock. Devotees were trying to touch it which makes them feel they are embracing God. Uttering the name of Shree Jagannath as I enter through Singha Dwara, there is a flight of 22 steps (in regional language its called Baisi pahacha; baisi means 22, pahacha means steps) leading to the temple complex. While climbing up through the steps we can see devotees bowing down in the mid way exultant in devotion. Some parents made their kids to roll down the steps slowly, a way to seek the blessings. And finally we reach the temple yard, with area of more than 4,20,000 Square feets. The noon ritual was over and I joined the crowd which was moving slowly inside the temple. Its a continuous flow of people going in and coming out. People shouted “Jai Jagannath…Mahaprabhu ki Jai” as the crowd ahead of me moved inside. I managed to get in. Gradually the idols were visible. First, a few glance of Lord Balabhadra ( the eldest sibling), then Godess Subhadra ( the youngest one) in the middle and then Lord Jagannath with his dark face, big round eyes wide open, smiling red lips,hands half carved, ready to listen to our prayers. A guy of my height (5’11”) could just see some part of his face and torso because of the distance. You are only allowed to get a close look if you bribe the priests or pandas there. The hall smells like coconut water with incense sticks. Then the securities won’t allow to stand for more than few seconds, everyone needs a chance to see and the crowd is big. I joined my hands raised above my shoulders, closed my eyes and thanked Him for everything. Breathed fresh air coming out of exit gate and damn I was sweating. Although it was all worth it. The images of Lord Jagannath and His siblings are actually made up of a trunk from a divine tree (usually a neem tree; the body is reconstructed in every 12 to 19 years ). The idols are not constructed as full human form, rather they are an incomplete form. There’s a very long story behind it which I may share in a later post. Shree Jagannath otherwise known as Mahaprabhu, Kalia thakura and Daru Brahma is actually a form of Lord Vishnu. The temple has its own kitchen which could feed from thousands to lakhs in a day. It is considered as the largest kitchen in the world. The prasad (food) is prepared in earthen pots with firewoods only. After being offered to the God these are sold in Anand bazar (market of pleasure), an area in the north east corner of the temple enclosure. They say that even if the number of devotees exceeds in a day, the food never falls short. You can find devotees of other species as well, frolicking in their own way. The Rhesus monkeys ( Rhesus macaque). Dont mind them. Spending like 40 minutes inside the temple, I came out of the complex and collected my stuffs back from the stand. Took a walk to see all the sides of the temple with the gates/ entrances. The Northern entrance is called Hasti dwara or elephant gate. It was in a state of renovation. The Southern gate is called Aswa dwara or horse gate. And lastly the Western gate known as Vyaghra dwara or tiger gate. 1. The flag at the top always floats in the direction opposite to that of wind. My observation: Its 90% exact, although if u feel the wind blowing from west to east, the flag floats towards North west. 2. The Chakra or the wheel atop the temple always faces you, irrespective of your position. My observation:Its not 100% exact. If I move or change my position or direction, the wheel doesnt faces me exactly. It faces slightly sideways. 4. No birds or planes fly exactly above the temple. My observation:Nothing flies exactly over the temple. 5. In the cooking process, seven earthen pots are kept one above the other over the fire wood. The topmost pot gets cooked first followed by the bottom pot in order. My observation:well I didnt have the access to the kitchen so no comments on this but there has been documentaries on it stating it correct. Tired and famished as I stand in the middle of the Grand road, the scene looks like a voulebard with sovenier stores, shops and snacks stalls lined up across the road. 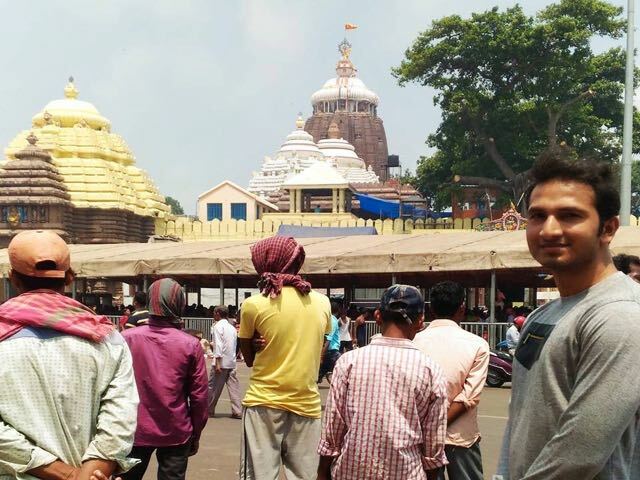 I had spent around 10 to 20 minutes in other temples and utilized maximum time for the main Jagannath temple. Its 2.30 pm and I headed towards my hotel grabbing a lunch on the way. A sound nap was very much required to get re-energize for my evening stroll. It was 6.30 pm and time for an evening walk along the shore where we can enjoy the cool coastal breeze. Model beach was within 200 meters from my hotel. It was dark and my plans to take a dip were potsponed to the next morning. The market along the beach was spreading a colorful canopy. 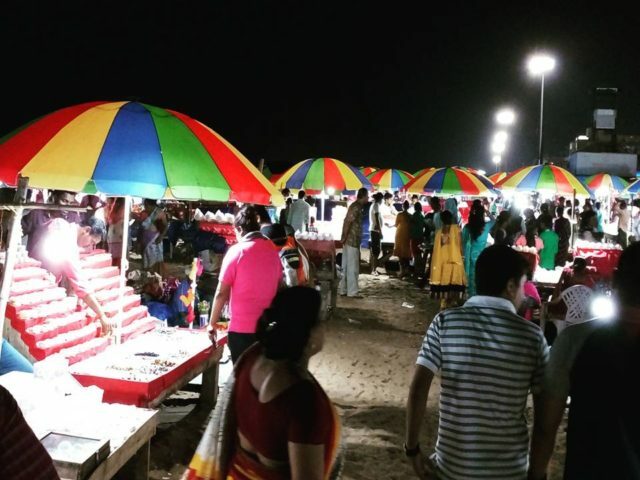 The market flourishes towards the Golden beach area. If you have no other plans visiting the temple in the evening or at night can be pleasant. Most people prefer in that way. I wandered for a while, got myself full, got back to the room and died for the next 8 hours. The next morning I gulped my breakfast and ran to the beach. Model beach is quite peaceful with soft sand grains and devoid of population. You can hardly see 2- 3 groups or families. Ah yes! I took a dip. Walking along the shore I reached the Golden beachside. 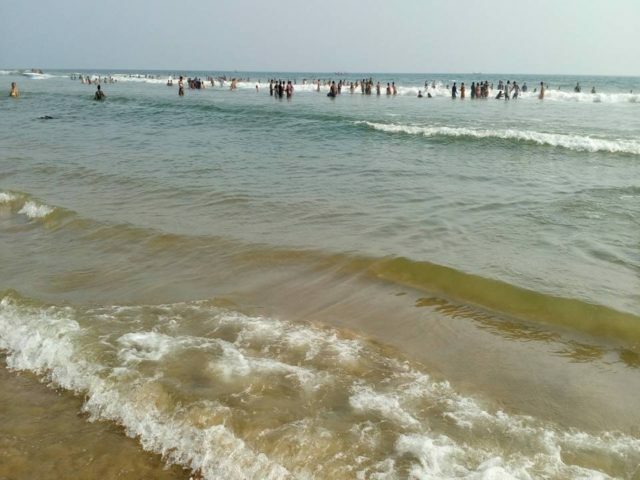 This is more populated since this area has maximum number of sea facing hotels and market. Its a long stretch of shore extended to the light house area. You can choose to walk and explore or hire tricycles for to and fro. Girls please apply or carry a sun screen lotion because chances are high that you will get tanned. And guys…doesnt matter right? My trip to Puri completes here as I return to take a shower. Spent the afternoon editing pictures and then checked out of the hotel at around 4 pm. Buses for Rourkela from Puri leaves early evening, with an hour halt at Bhubaneswar for dinner. As I sat inside the bus I realized there was a pinch of sand still inside my shoe. Must have been from the shore. May the blessings of Lord Jagannath always be with you. Take care. Will see ya in my next trip. An artist, a traveller, a government employee and the only child to my parents, my life is a blend of fun and responsibilities. Close to Nature and inclined to wildlife, I do not need a reason to travel. I just plan and escape whenever I can. My name is Sudip Samal, living in Odisha, India. I work in Food Corporation of India and my hobbies include painting, dancing, singing, travelling and capturing moments in a click. My bucketlist covers all the major National parks and Sanctuaries in India and slective ones abroad. I am also attracted to places with historical ruins, places with peculiarity like mystries or sights beyond explanations. Welcome to Ghumakkar, Sudip. Thanks for the detailed account of the temple town. Golden beach seems to be pretty shallow as people can go far in yet the water level reach up to knee only.